This release continues to improve and develop the functionality of the system in response to feedback, including changes to the dashboard, the opportunity to search across almost 20,000 titles now available in the knowledge base and continued expansion on our export formats to now include and export for the OCLC link resolver. We are introducing information icons on various screens across KB+ to provide additional information. (we are currently working on the text to populate the information icons and this will be available soon) We hope this will help towards making the system more intuitive and easier to use. Each user can decide whether they wish to see the information icons or not, and by default this option is switched off. 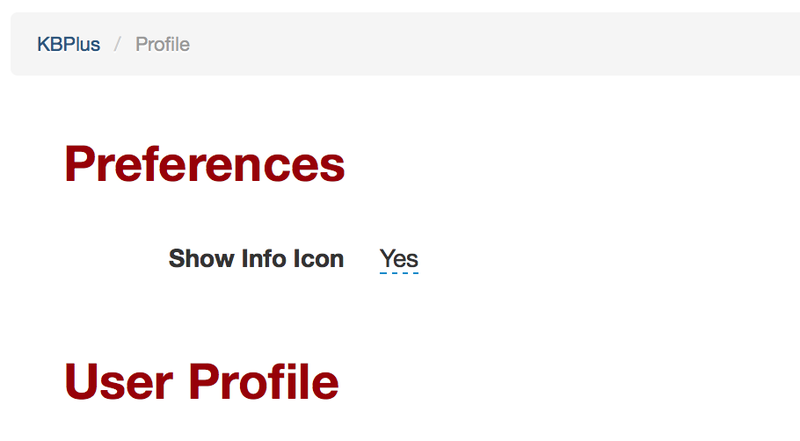 In order to see this icon you must go to your Profile (menu at the top right of the screen) and edit the new “Show Info Icon” setting to ‘Yes’. Latest discussion – you will no longer see any automated postings and therefore will be a shorter list focusing solely on discussions created by KB+ users. We hope this will make the dashboard display clearer and make it easier to catchup with the latest discussions. Under the ‘History’ tab you will be able to see a list of your actions in relations to any ‘To Dos’ for a package. You will therefore have a list of which actions you accepted, rejected or are pending per package providing a useful record of the changes that have occurred. You can now search across all the titles within the knowledge base by selecting Manage>All Titles and entering a search term. Once you select a title you will also be able to see all the packages where this title appears providing a useful overview of cross-coverage. The search is currently done by ‘Phrase Searching’ but we are keen to hear how you would like this type of search to work and how you would like the results displayed. We are keen to ensure that you are able to use KB+ data with the other systems you work with and therefore continue to develop export formats which may be of value, please let us know if there are other types of export formats you might require. Our latest addition to the formats is one for the OCLC Resolver, which joins the existing ‘Serials Solutions’ and ‘SFX’ exports. Previously in order to see relevant export formats you had to edit your profile, we have now removed this requirement to improve accessibility and awareness, and so all users now see all the available export options. You can now remove a licence from a subscription by going to the subscription details screen and changing the Licence value to ‘None’. This removes the link between the licence and the subscription. Once a licence is has been added to a subscription there is now a ‘Link’ which you can click to take you directly to the licence details screen to easily check licence terms and related information. This is in addition to a similar link available from the Issue Entitlement screen.